Impressive isn’t it, what inspiration can do? 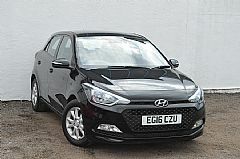 It’s what gave the New Generation i20 its sophisticated styling, outstanding refinement, spacious interior and clever features. And the great thing about inspiration is that once you open your eyes to it, you’ll see it everywhere. The New Generation i20 has been precisely crafted to meet the challenges of a busy lifestyle. With attention given to the finest details and quality of materials, it’s built to exceed your expectations. Not forgetting an industry-leading 5 Year Unlimited Mileage Warranty to guarantee total peace of mind. 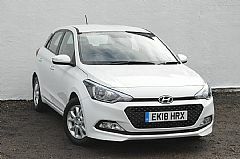 Discover the small family hatchback that’s full of character and instant eye-catching appeal. Choose from S, S Air, the eco-friendly S Blue, SE, Premium and top-of-the-range Premium SE models. The New Generation i20’s distinctive design is accentuated with features such as daytime running lights, which provide a striking focal point and ensure visibility during daylight. When the light fades, Premium and Premium SE models offer halogen projection headlights which automatically switch on, providing impressive night vision. SE models also benefit from this upgrade as part of the standard Driver Assist pack. Another feature are the rear LED combination lights. Following the curve of the rear window, they integrate seamlessly within the boot and feature brighter, more illuminating bulbs. While those behind will appreciate the intricate rear design. Whether you’re looking from the inside or admiring from the outside, the New Generation i20 offers stunning views. The sliding and tilting panoramic sunroof bathes the interior with natural light giving the cabin an airy and spacious feel – and helping everyone feel more relaxed. in you live in Ilford, Romford, Walthamstow, Leyton, Leytonstone or Woodford in London or Loughton, Chigwell, Buckhurst Hill or Epping in Essex or even Enfield in Middlesex, Allen Briggs is your local Hyundai dealer.